Albert Kimpton represented a London-based firm of wholesale drapery warehousemen called Devas, Routledge & Co. Ltd. He spent the week travelling throughout the east of England promoting the company and coming home for the weekends. There is a description of the activites of his employer here. Below is an account of Albert Kimpton's funeral. It's interesting to see that the Great Northern Railway was represented by the stationmaster at Cambridge, Mr. Essame who, just under six years later, would take over as stationmaster at Grantham. This report appeared in The Cambridge Independent Press on 28th September 1906. From The British Newspaper Archive http://www.britishnewspaperarchive.co.uk/ Image © THE BRITISH LIBRARY BOARD. ALL RIGHTS RESERVED. Note that Albert Kimpton had previously been on a train involved in an accident, and he had purchased insurance cover for the risks associated with regular rail travel. Britain's railways then did not have the reputation for safety that they enjoy today. Albert Kimpton has a very attractive memorial in Great Shelford churchyard, with a carved angel standing 7 or 8 feet high with a bowed head. I attended the school next door in the 1970s, and it was rumoured that if you looked into the angel's face its eyes flashed. 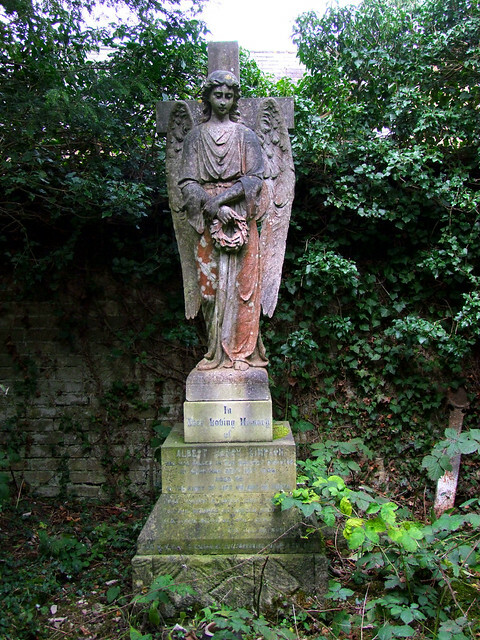 It was a common to dare somebody to go "over the wall" into the churchyard and look at the angel's face ... but hardly anyone ever had the courage to do so. Below is a photograph of the memorial. Regarding the memorial statue of Albert Henry Kimpton in the graveyard in the church next to Shelford Primary school. I went to the school between 1970 - 1974 and remember the tales of the statue's eyes. As kids we did often dare a classmate into going over the low wall to get into the graveyard adjacent and check. I even did so myself on one occasion and survived to tell the tale. No moving eyes but as a small child the statue did look huge and scary. On a recent trip to the area I went to find the statue (I always remembered it from my childhood) and rekindle some school memories. It is sadly very overgrown around the memorial now but can be found fairly easily towards the rear of the graveyard. The history behind the person who died in the rail disaster is fascinating, as I discovered after this trip and doing some research and is a very interesting twist. Thank you very much for telling us more about this statue and your bravery in approaching it through the churchyard from the school grounds - and for your update on its current condition too. How remarkable, Andrew, that you should have visited on a mission so similar to mine ... with such similar results! It is a shame that the old path we used to use between the school and the church is now obscured and overgrown, and that the churchyard which used to be so beautifully tended now looks so derelict. Perhaps we need to create a group of Friends of the Kimpton Memorial (or some such) to ensure that it remains accessible. Do please get in touch if you'd like to explore this idea further ... or even if you'd just like to share a few reminiscences of Shack, Webbo, Kipper and Dodd ... I am quite content for the promoters of this website to pass my e-mail address to you for this purpose. Thankyou Jeremy, I'll forward your comment to Andrew. Do please let us know if your idea to improve access to the memorial takes root.